Ducks are great swimmers — but they also make for great boats. 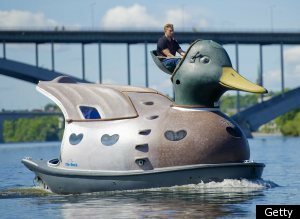 At least according to shipbuilder Christian Bohlin, who sailed his eye-catching duck-shaped ship across Stockholm harbor on May 27. One of two novelty boats constructed by the shipwright, this waterfowl-inspired watercraft has plenty of high-flying features. The ship reportedly boasts a sauna, a kitchenette and two sleeping cots for bird-brained sailors. via Christian Bohlin Builds Giant Duck-Shaped Boat. 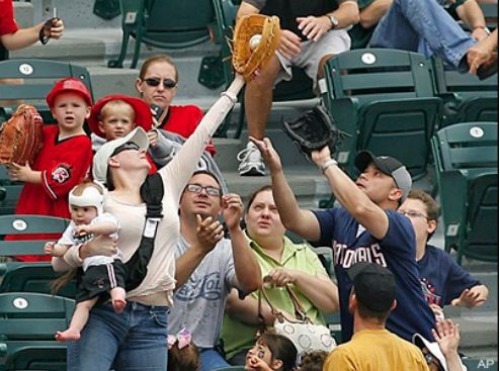 Sure, those millionaire outfielders are good but can they catch a fly with an eight month old baby in one arm and a backpack strapped on? Maybe they should hire Tiffany Goodwin to give them lessons in how it’s really done. More via KOMO News | Offbeat. The victim told deputies that he and Rhash “were having an argument about what food was hers and what was his” when the suspect “threw butter at him striking him in the leg,” the document notes. More via Dawn Elizabeth Rhash Attacks Roommate With Butter, Cops Say. May 26, 2011 Posted by oldstersview | Dumb Crook	| Comments Off on Buttery Battery? Postings here may be a little sparse for the next few days. I am in Wyoming at Jackson Hole and from there to Bryce, Utah, then back home. The new book by Annie Jacobsen, Area 51, dismisses the alien spacecraft theory for the Roswell incident and suggests that Stalin, inspired by Orson Wells’s famous radio adaptation of the HG Wells novel War of the Worlds, enlisted Joseph Mengele, the infamous Nazi “Angel of Death” who had fled to South America, to create a crew of “grotesque, child-size aviators” who would be flown in a jet-propelled, single-wing Horton Ho 229 and be flown to America to cause hysteria similar to the 1938 broadcast. But the plane, remotely piloted by another aircraft, crashed and the Americans hushed up the incident. A man who dressed as Brian the Snail from The Magic Roundabout to compete in the London Marathon has finally finished… after 26 days. After donning the giant 9ft-long snail suit, Lloyd Scott had to lie on his stomach and slide along on a sled until he’d completed the famous 26.2-mile course. via Odd News | newslite.tv. According to a report in the UK’s Daily Mail, Russia’s Kemerovo State University is planning to set up a research institute to study the recent increase in yeti sightings in Siberia. Fifteen witnesses claim to have spotted the elusive hominid in the last year alone. More via Russian University to Set Up Special Yeti Research Institute. A Taranaki farmer has lost a cow but kept his milking shed following a freak series of events. A motorist was traveling along a dark, wet Manaia Rd near Kaponga on Friday night when he hit and killed a black friesian.The animal was thrown over the top of the car, peeling back the (hood) and shattering the windscreen. The car smashed into a pole which caused a power surge to race along the wires into the farmer’s house. The same surge blew up the cowshed meter board and set it on fire. However, it melted a water line directly above which extinguished the blaze. More via National – 3 News. May 15, 2011 Posted by oldstersview | accident messes, animals	| Comments Off on Rube Goldberg’s cow? What? No jam?? 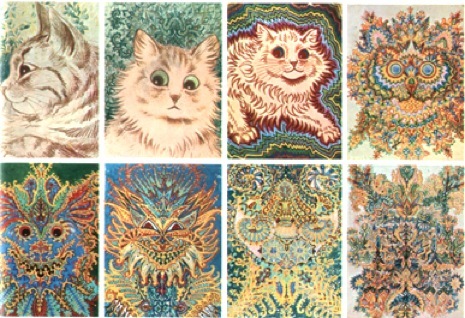 And you call that art?? A Dutch museum-goer got into a sticky situation when he waded into a carpet of creamy peanut butter not realising it was a modern art installation. The hapless visitor somehow failed to spot the 14m expanse of edible goo at the Boijmans van Beuningen museum in Rotterdam, the second largest city in the Netherlands, Algemeen Dagblad reported overnight. Bemused tourists watched as the man sank into the 1100 litres of peanut butter – enough to fill more than 2000 regular-sized jars. He has been asked to pay for the damage after leaving a trail of footprints. May 12, 2011 Posted by oldstersview | Dumb Stuff	| Comments Off on What? No jam?? And you call that art?? An unusual crime has police searching for a suspect. A surveillance camera at a Kroger in Greenwood caught a man stealing $700 worth of teeth whitener. via Weird news – msnbc.com. A 42-year-old Indiana woman who authorities believe was high on bath salts trashed a hotel room Wednesday, Indiana State Police said this morning. Police said (she) was sitting on (a) bed when they arrived at the hotel…rambing about evil spirits and needing to write on the walls of the room to protect her from the spirits. A family member who was present told police that Winter was an abuser of bath salts. When snorted, bath salts cause hallucinations, police said. Pet Peeve, one of many incorrect uses in newspaper reports and on TV news. “After?” Really? They weren’t killed “when” the falling building parts struck them? If it truly was “after” then what killed them? More with video of the three criminal masterminds via NewsChannel 9 WSYR. Ripped off in your drug buy? Probably best not to call the cops. Upset that his cocaine dealer had given him the wrong change, a South Carolina man called police to complain about the unsatisfactory transaction and, of course, was promptly arrested. More via The Smoking Gun. May 5, 2011 Posted by oldstersview | Uncategorized	| Comments Off on Ripped off in your drug buy? Probably best not to call the cops. …unless it is 268ft 4in long like the one rolled by long time Cuban cigar roller Jose Castelar Cairo. There’s a picture of both the cigar and the man at the link. The problem with most touchscreen smartphones is that you need two hands to run them. This weird looking nose stylus solves that problem, by letting you peck away using your nose when your other hand is…uh…preoccupied. It started as a 1930s Boeing Stratoliner, owned by Howard Hughes. 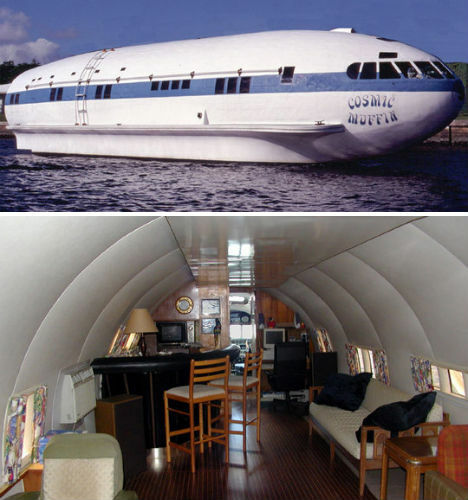 The tail and wings were cut off to transform it into the houseboat it is today, dubbed Cosmic Muffin and based in Fort Lauderdale, Florida. via 12 Amazing Houseboats & Floating Homes | WebEcoist.